The Australian Steelers remain undefeated at the GIO IWRF Wheelchair Rugby World Championship, beating Denmark 61-49 on day three. Captain Ryley Batt continues to dominate as Australia’s highest goal scorer, scoring 30 goals against Denmark. Jake Howe from the Steelers is excited to be performing so well at his first World Championship. “They were a little bit tougher than our last opponents and we are looking forward to tomorrow,” said Howe. The game saw Denmark losing their first game of the Championship, making Australia and Japan the only undefeated teams in Pool A. Australia takes on Japan tomorrow evening in a top of the Pool clash. Colombia won their first ever World Championship game this morning against Poland. Colombian player, Carlos Neme was thrilled on their first win of the competition – owing it to their fans and families. Great Britain are two-for-two on day three, beating both Canada and Colombia. Britain had a triumphant day, beating Canada 55-43 in the morning and Colombia 57-20 in the evening. Britain came out hard after their loss against the USA yesterday. "After yesterday we were disappointed with the performance in the second half of the game against the USA but we knew we had to bounce back,” said Ryan Cowling. Without a win yet this Championship, Canada are learning from every game to improve their performance. “We are rebuilding - our team is young and we are gaining a lot of experience from these games,” said Eric Rodrigues from Canada’s team. The Colombian game saw the largest point margin of the Championship, with Britain scoring 37 more than Colombia. USA remains undefeated, delivering France their first loss of the Championship, 54-39. The USA remain undefeated in Pool B with their win over France this morning. As a top of the Pool clash, the USA team did not underestimate France and gave it their all to secure the win. “We never look past anyone and we got to take care of business,” said Chuck Melton from USA. France pulled back from the loss, beating Poland 51-39 in the afternoon. “We expected to have a tough game against Poland. We tried to keep the pressure and, in the end, it payed off,” said French player Christophe Salegui. New Zealand have secured their first win of the competition, beating Ireland today. Neither side had won a game yet at the Championship, so this was a vital win for New Zealand. “There is no better feeling then to win in sport. Each game we keep on getting better, our communication is getting better and the unity on court is getting better,” said New Zealand’s Michael Todd. Ireland disappointed, hoping to secure their first win of the competition. “We are definitely disappointed because that game could have been winnable for us. We have a couple of newer players on the team. The tournament has been a trial by fire for them,” said Ireland’s top scorer, Thomas Moylan. Japan was tested by Sweden in a close match, winning 48-46. With Sweden leading at half-time Japan managed to fight back and secure a win, remaining undefeated in the Championships. Japan did not expect the Swedish to deliver such a challenge after their loss against Australia yesterday, 71-38. “It was a very head to head game. It was tougher than we expected but Sweden put in all the effort they had,” said Japanese player, Masayuki Haga. Classic Waratahs hand it to Classic Wallabies in Exhibition match, 11-8. The all star-studded Classic Waratahs side have defeated the Classic Wallabies team in a friendly Exhibition match to raise awareness and support for the Wheelchair Rugby World Championship. Evania Pelite, Wheelchair Rugby World Championship ambassador and Women’s Rugby Sevens superstar was honoured to be part of the Classic Wallabies team. “It’s such a great opportunity. It’s a notoriously tough sport and I have so much admiration for all the players here at the World Championship,” said Pelite. 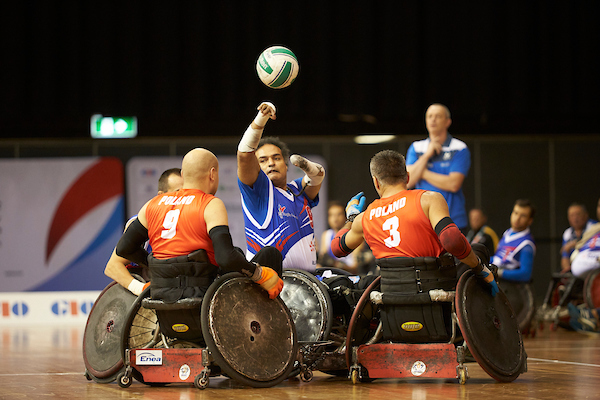 Parramatta are the GIO 2018 IWRF Wheelchair Rugby World Championship Club Rugby Champions, defeating Eastwood 19-15. Parramatta Two Blues took home the Champions title of the Club Rugby Championship. The Club Rugby Championship was held to raise awareness and support for the Wheelchair Rugby World Championship.